1.Boosts signal for All U.S. & Canadian cell carriers. 2. Dual Band Signal booster is fashion globular shape . Step 1. Search a position where can receive good signal by your cell phone (more than 2 or 3 bars). After that you can install the Outdoor Antenna on that location, towards to the base station or Cell Tower. Step 2. 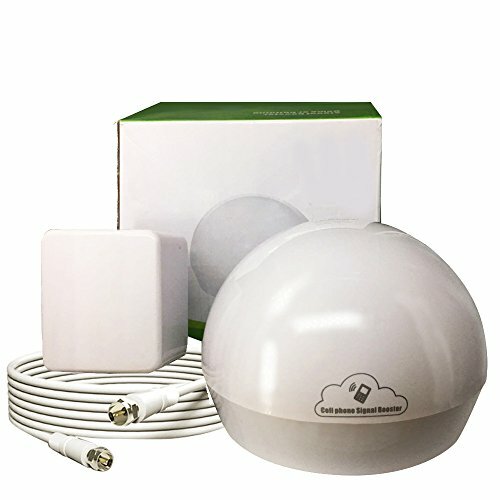 Use the 15m cable to connect the Outdoor Antenna and Signal Booster. Step 3. After finished all parts then please check all connectors well again and trun on the power.The Installation is Complete. 【Dual Frequency】 Cell Signal Booster With Dual Display:850MHz+1900MHz. Can Enhances 70 dB For Your Cell Phone Signals. 【Support】Compatible With All North American (U.S. And Canada)Carriers.2G/3G/4G T-Mobile,AT&T Verizon Sprint Cellular. 【Perfect For】 1000-2500 sq ft Or Small Offices.Stop Dropped Calls Any More,Better Voice Quality,Faster Uploads And Downloads. 【Frustration Free Set Up】 The Simple Instructions And DIY Installation Make It Easy To Get Your New Booster Set Up And Working Quickly. All Of The Components You Need For Installation Are Included In The Package With Easy To Read,Step-By-Step Instructions.Customer Feedback The Booster Can Be Installed In Ten Minutes.